A long time ago people thought is was okay for one group of people to make servants of other people. They called these people slaves. One slave was named Androcles. He had been a slave for many years and had served his master loyally. He had never tried to run away or escape to find his freedom. But, one day, his master began to treat him badly. The master became disagreeable and began to beat Androcles often. Androcles decided to run away. He left the city and ran away to the countryside where he hoped to hide from his cruel master. He lived for a time by eating wild grapes, seeds from plants that grew and wild berries. But, as he moved farther from the city, he entered a thick forest. There he could find no food and became very hungry. Androcles felt like he was going to starve to death. He crawled into a cave and laid down on the floor. He was so tired and hungry that he didn't care if he lived or died. He had just fallen asleep when he heard a growl. He looked up and saw a huge lion limping into the cave. It was roaring. The poor slave was afraid and had no way to escape. He thought the beast would kill him. But, the lion did not kill Androcles. It limped over to the side of the cave and laid on the floor and roared in pain. The slave watched as the lion held up one paw and tried to bite at it. The animal had something stuck in its foot and could not move without being in pain. Androcles sat still for a while. Then, he got courageous and walked to where the lion lay on its side. He reached down and gently picked up the lion's paw. The lion roared in pain, but it did not try to hurt the slave. Androcles saw that a long and sharp thorn was stuck into the ball of the lion's foot. He grabbed the end of the thorn with his fingers and pulled with all his might. The thorn came loose, and Androcles fell backwards across the cave. The lion had roared fiercely as the thorn was torn from his foot and leaped to his feet. It stood leaning over the slave. The slave closed his eyes expecting the lion to eat him. But instead, the lion simply licked his face like a puppy dog would lick the face of a child. Then the lion laid down again on its side and cried some more. It's foot was still swollen and hurt. Androcles left the cave to gather wet moss and wrapped the lion's foot to help it continue healing. He brought the lion water to drink and watched over it until it was better. This was the start of a great friendship. Shortly after, the lion left the cave and came back with a rabbit and laid it at Androcles' feet. The slave knew that his new friend the lion had brought him something to eat. Androcles built a fire towards the mouth of the cave and cooked the rabbit. He ate half and gave half to his new friend, the lion. Day after day after that, the lion and the slave walked the woods together, hunting and playing together like two friends. But one day as Androcles walked into the woods alone, he met a company of soldiers. They recognized that he was an escaped slave and took him back to the city. The punishment was severe for Rome slaves who ran away. His master demanded the harshest punishment for Androcles. The slave was taken to be locked up in a jail cell at the arena. The arena was a place where thousands of people came to watch races and sports. It was also a place where people came to see terrible punishments be given to criminals like runaway slaves. A lion was caught and locked up without food. The authorities were going to feed the slave to the hungry lion. Androcles was let out of his cell and shoved into the open arena. He looked around and saw crowds of people laughing at him and waiting for the hungry lion to be released. A roar went up from the crowd as a gate opened and the lion rushed into the arena. The lion roared in anger. It was hungry, and there was food in the middle of the arena. That food was Androcles. The lion rushed at him and jumped into the air. It landed at Androcles' feet and reached up to put its face next to his. The crowd was on its feet. Everyone knew what would happen next. The lion would open its mouth and Androcles would meet his end. Instead, the lion stuck out its tongue and gave the slave's face a big lick. The lion was his friend. It was the same lion who he had helped earlier. 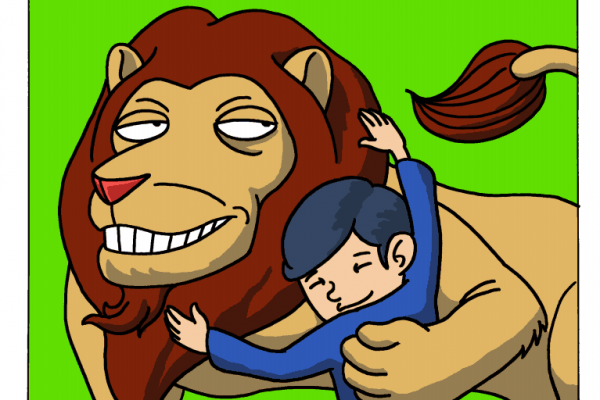 Androcles put his arms around the lion's neck and gave it a big hug. Then he rubbed its head and when it turned over, he scratched its belly. The people had expected to see the man get eaten and could not understand what was happening. They demanded to know why the lion had not eaten the man. "I am a man," said Androcles. "Yet you treated me badly and made me your servant. I helped the lion, and he has become my friend. He treats me better than people have treated me. We love each other like brothers." Suddenly the people felt sorry that Androcles had been treated badly. They demanded that he be set free. So, Androcles was let go. He was given his freedom. The lion was also let go. It became the pet of Androcles, ad the two lived together as friends for many years. Note: This story was adapted from a fable originally written by a slave many years ago in ancient Greece by the name of Aesop. Aesop became famous for his stories and was later given his own freedom because people loved the stories he told.